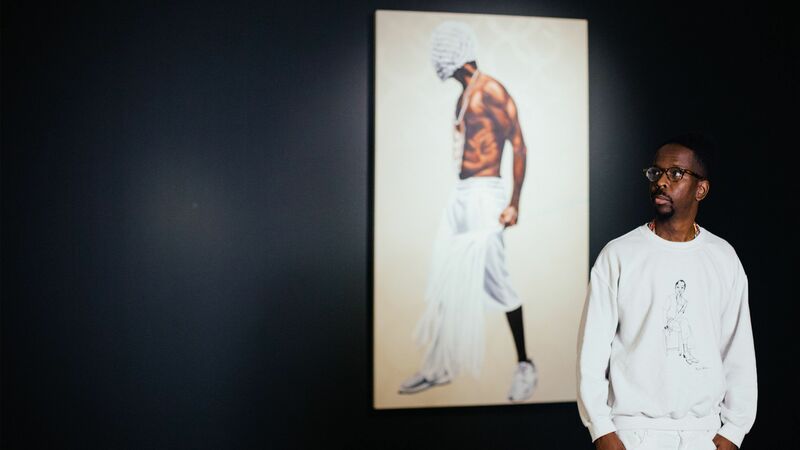 There is a duality — a defiant contrast of ideas, culture and images — that arises within Emory graduate Fahamu Pecou’s art exhibition “DO or DIE: Affect, Ritual, Resistance,” on display at Emory’s Michael C. Carlos Museum through April 28. 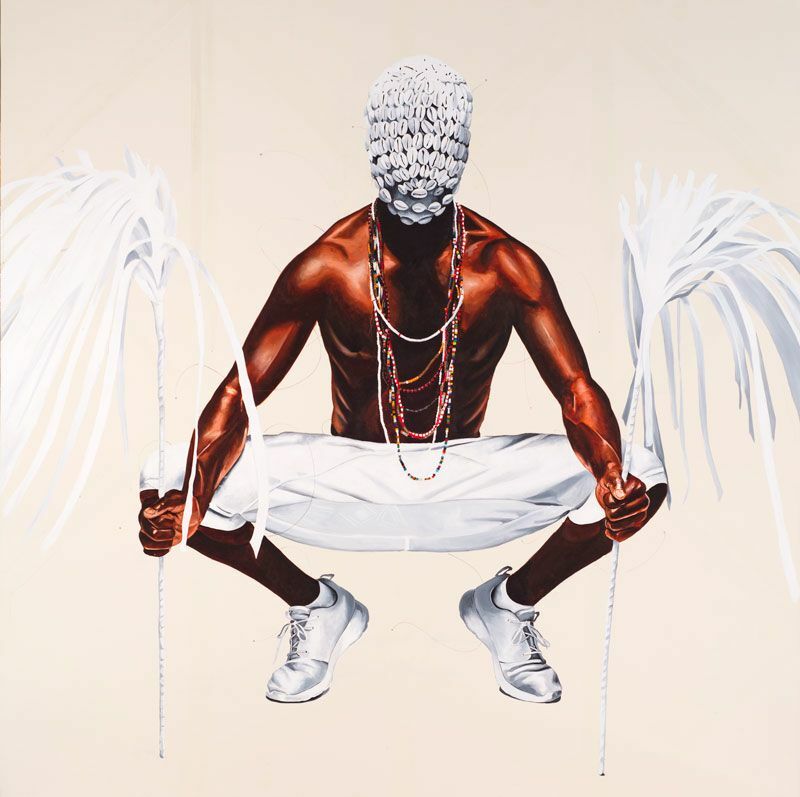 Through paintings, drawings, photography and video, Pecou deliberately juxtaposes elements of ancient African-based spiritual traditions with sharp observations on modern violence aimed against black male bodies, from Martin Luther King Jr. and Medgar Evers to Emmett Till, Trayvon Martin and Michael Brown. Fahamu Pecou. Egun Dance II, 2016. Graphite and acrylic on paper with cowries. Michael C. Carlos Museum. Anonymous gift. 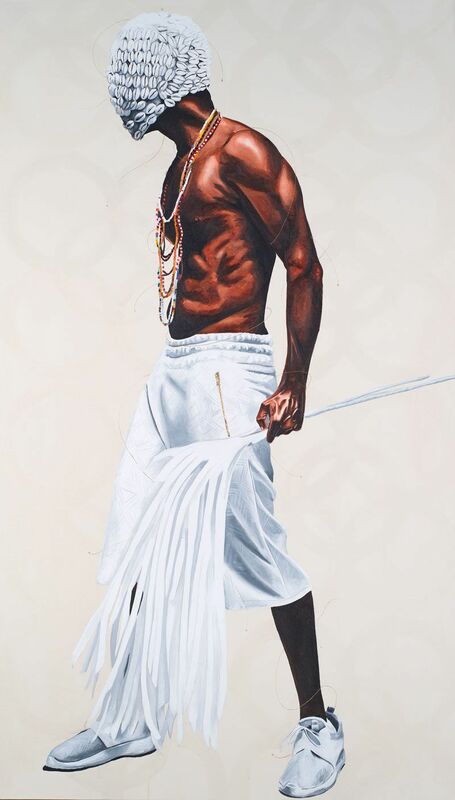 Through Pecou’s art, contemporary victims of racial violence are presented within the context of Ifá, a diasporic religion of the Yoruba of southwest Nigeria; here, where spirits are infinite, a healing alternative exists for slain black men and their communities. “DO or DIE” explores those intersections — past and present, hopeful and tragic — in a traveling exhibition that has already won critical acclaim at showings across the country. Organized by the Halsey Institute of Contemporary Art at the College of Charles, in collaboration with the Carlos Museum, Emory’s exhibition marks the fourth stop on a nationwide tour. But to Pecou, this one is special — his first formal art show at Emory and a homecoming, of sorts. Not only were many of the intellectual ideas developed within it nurtured at Emory, it was created as a dissertation project while the interdisciplinary artist and scholar was here completing his doctoral studies. Many of the themes had long infused his work, reflects Pecou, who earned his PhD from Emory’s Laney Graduate School in May 2018. But something larger began to take shape following the death of Walter Scott, an unarmed black man who was fatally shot by a white North Charleston police officer following a routine traffic stop in April 2015. Soon afterward, Pecou received a newspaper clipping about the shooting attached to a note from Mark Sloan, director and chief curator at the Halsey Institute of Contemporary Art. Moving forward, “a lot of things coalesced, sending me down a path I had been shying away from,” Pecou acknowledges. “It was life changing, and I don’t mean that in a small way,” he reflects. Fahamu Pecou. rising, 2016. Acrylic and gold leaf on canvas. Private collection. Though Pecou’s art already addressed contemporary representations of popular culture and the black male body, being at Emory allowed him the time to explore those issues as a scholar, and those observations and insights would emerge as the focus of his dissertation project. Knowing that he wanted to pursue an innovative approach that embedded original artwork, video and performance within a traditional text-based framework, Pecou found support, creating a foundation for the “DO or DIE” exhibition. Within his work, Pecou was intrigued by a question: Under the looming threat of death and despair, how can we inspire life? The answer, it seems, arises from the power of creative expression and ritual. “One of the things I’m really fascinated by is the way that certain concepts, ideas and practices that form our ancestral past continue to manifest, even in our day-to-day lives,” he says. "It&apos;s a way of raising up lost spirits, activating their power, affirming our own": See Fahamu Pecou at work on "DO or DIE" in 2016 and hear him describe how "making the work is itself a ritual." Centered around an Egungun mask — traditionally part of Yoruba masquerades connected to ancestors — Pecou&apos;s artwork depicts the spirit’s journey, including its encounters with divinity and its invocation through the ceremonial Egungun dance. In that way, “DO or DIE” affirms life and life beyond. “It reclaims what was lost,” Pecou says. Fahamu Pecou. the return, 2016. Acrylic and gold leaf on canvas. Courtesy of the Lyons Weir Gallery, New York. The Emory exhibition showcases four new works from Pecou, including three drawings and one large painting. The museum’s African galleries, in which historic Yoruba artwork such as Egungun from the permanent collection will be on view, will provide a wider glimpse into the history and culture that have inspired Pecou’s work. “African spirituality, concepts and philosophies allow us space and freedom to think about and see ourselves as whole and human,” he says. “These ideals contradict the broken, tortured and oppressed images of blackness that we find in the context of Western visual culture. It’s imperative to realize and to know that our history and our culture predates the enslavement of our ancestors as well as the history of our oppressors,” he says. There is a freedom in acknowledging “that our ancestors were not ‘slaves,’ but a people who were violently and forcefully enslaved,” he adds. “That they had cities and schools, art, and culture that predate the European enlightenment by millennia. Written by Kimber Williams and Allison Hutton. Photography of Fahamu Pecou at the Carlos Museum by Stephen Nowland. Art by Fahamu Pecou. UPCOMING EVENTS FOR "DO OR DIE"
Cowrie shells have been used historically as currency, adornment, game pieces, and in divination. For the Yoruba of West Africa, sixteen cowries are cast by a diviner in an Opon Ifá tray to reveal the messages of the Orisha. After viewing the cowries embellishing an Egungun from Nigeria in the African Gallery, families are invited to explore the various Fahamu Pecou utilizes cowries in "DO or DIE" before making cowrie bracelets to carry this powerful symbol of Africa home. Sunday FUNday is a free drop-in event for all families. No registration is required. 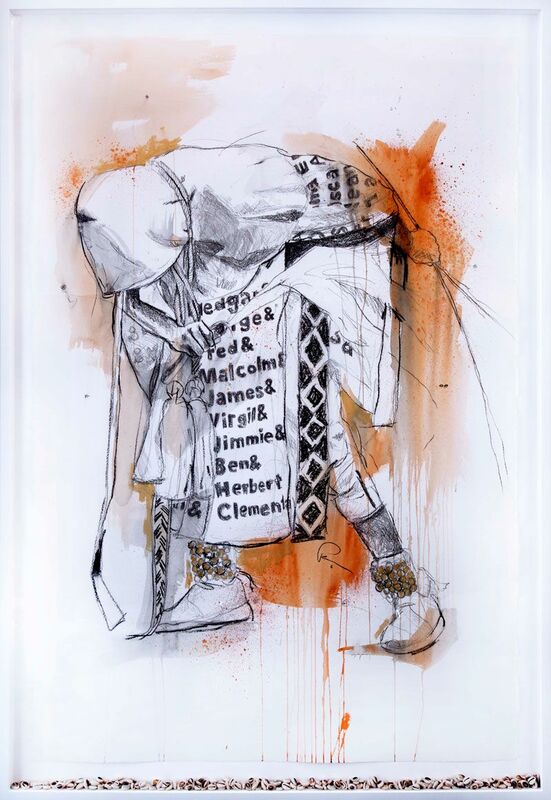 The tragedy of young, black men whose lives have ended violently is a recurring theme in the visual art of Fahamu Pecou and the poetry of Jericho Brown, who both question who we are as a nation and how we survive. Hear Brown, award-winning poet and director of the Creative Writing Program at Emory, read from his body of work, including his new book, "The Tradition," surrounded by Pecou&apos;s powerful images in the exhibition "DO or DIE." This program is free and open to the Emory community and the public, however space is limited and registration is required by calling 404-727-6118. Okorie “OkCello” Johnson is an Atlanta-based cellist-composer whose music integrates cello, live-sound-looping and improvisation on original compositions which collide classical with jazz, EDM, reggae and funk. Okorie will collaborate with children in a musical response to three Egunguns in the Carlos galleries: two strikingly different Yoruba Egunguns and Fahamu Pecou’s "New World Egungun." The music created by the children will be incorporated into the OkCello Concert that follows the workshop at 4 PM. For elementary and middle school-aged children. Fee: $15 for Carlos Museum members; $20 for nonmembers. Registration is required by contacting Alyson Vuley at 404-727-0519 or avuley@emory.edu.